In this era of information, political spending and municipal budgets are still often shrouded in confusion and mystery. 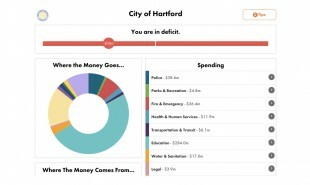 But a new web app called Balancing Act hopes to change that, by enabling US citizens to see the breakdown of their city’s budget via adjustable, comprehensive pie charts. Created by Colorado-based consultants Engaged Public, Balancing Act not only shows citizens the current budget breakdown, it also enables them to experiment with hypothetical future budgets, adjusting spending and taxes to suit their own priorities. The project aims to engage and inform citizens about the money that their mayors and governments assign on their behalf and allow them to have more of a say in the future of their city. The resource has already been utilized by Pedro Segarra, Mayor of Hartford, Connecticut, who asked his citizens for their input on how best to balance the USD 49 million. The system can be used to help governments understand the wants and needs of their constituents, as well as enable citizens to see the bigger picture when it comes to tough or unappealing policies. Eventually it can even be used to create the world’s first crowdsourced budget, giving the public the power to make their preferences heard in a clear, comprehensible way. Could other interactive tools be used to help politicians survey the desires of citizens?